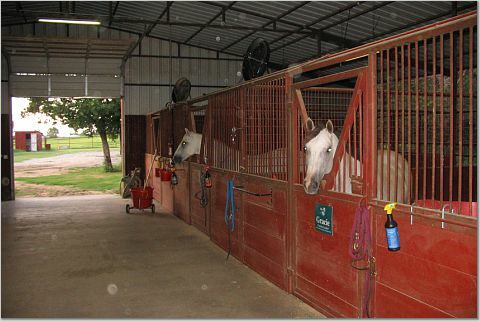 Pride Stables provides high quality horse boarding near Rhome, Texas. We are a small family run, 10 stall barn facility on 16 acres. It is a friendly place where comfort and safety are the highest priorities. We the owners live on premises and know each boarder and horse personally. We treat every horse as good or better than our own. Horses are checked and fed 3 times a day. Special care and feed requests are not a problem. We have all levels of riders from beginning trail riders to competing barrel racers and eventers. Everyone is welcome and comfortable. Pride Stables is very happy to announce the recent addition of Denise Barrows of Practical Equine Solutions. Denise specializes in building the confidence of young or inexperienced horses, and teaching them the basic skills to succeed in any discipline. Similarly, she works with students of all experience levels and backgrounds, to build a foundation of quality horsemanship and riding skills that are invaluable regardless of their equine goals. No matter what you or your horse need to learn, Practical Equine Solutions can help! Please visit her website at www.practicalequinesolutions.com through the links below. For PICTURES, see link in Favorite Web Sites below. Includes feed, hay and daily turnout. All breeds welcome, but sorry, no stallions. Just off 114, 3 miles west of 287.